Ahead of their sold-out appearance at This Feeling's Big In 2019 night we caught up with Sheffield's The Seamonsters to discuss their new single Blue Movie Baby, the slow-burn that sees them heralded as a potential breakthrough band six years in and their fierce independent streak. Hi. Could you introduce yourselves please and tell us how you got together? Ciara - Hey! We're The Seamonsters and we're a six-piece indie band from Sheffield. Most of us are childhood friends and we became close through a dance and drama group we all went to. We started the band when we were about 13 just messing around with covers and it's just grown from there. Ciara - The name came from the drama group we went to, we were all seamonsters in a pantomime and we started the band around the same time so transferred the name over. With six of you in the band, how easy is it to write songs, agree on the final versions and make other decisions? Ciara - Writing is definitely a slower process with there being six of us but it's more interesting as there's so much we can do and we're all full of ideas. Our general writing process is starting with someone's idea (we don't have one person that leads, we've all had a go at bringing the start of a song to the process). We work super collaboratively together so after we have an initial riff, drum beat or lyric we will all sit on the floor in a circle and add the instruments one by one like layers. We also write better when we go somewhere else to our normal practice room, our latest single 'Blue Movie Baby' was written in the highlands of Scotland on holiday together. You’ve been included in a number of tip lists for 2019. Having formed in 2013, does it feel a little strange to be getting this level of attention after so long? Lauren - I think from the inside it has definitely felt like more of a gradual build up, mostly because of all the hard work that’s gone into everything over the years so far, but we are super grateful for everyone who’s given us a listen and a chance this year to really grow and share our music far and wide. Do you think that time has actually helped you define and develop your identity and put together a stronger set of songs than if you had got the same exposure overnight? Lauren - I think time has definitely played a huge part in it all. It helps to put in perspective that you’re not just waiting to blow up and be famous, because it’s actually all the stuff in between that it’s really all about, and when you think about it that way it’s so much more exciting to embrace and develop what you’re doing both music and image wise. A lot of bands have a “look” but one of the things that makes you stand out is your individuality. Have you had to fight hard to retain that with people telling you to conform? Lauren - There have been a lot of people that have pushed us to set up more of a distinctive image even since the start, but as a group I think we just love to develop and change all the time or we’d get bored. In the industry as well nowadays I don’t think you can quite afford to consign yourself to something forever without struggling to keep it fresh. We’ve just always been our authentic, weird selves and I think that creates an image in itself. Your new single Blue Movie Baby is out now. Could you tell us a little about its subject matter and how you wrote it? Naomi - The subject matter of Blue Movie Baby was based on our love of romantic movies from the 1950s/60s and the idealistic love it presented, which massively differs from modern reality and dating. This idea sprung to mind during the writing process as it had a vintage feel to it. We had also recently seen Radiohead at TRNSMT festival, which inspired us to be more experimental, particularly with synth and drums. What are your plans for 2019? You’ve alluded to more releases and lots of touring. Finally, if you had to describe Seamonsters to someone who’d never heard of you, what would you say? 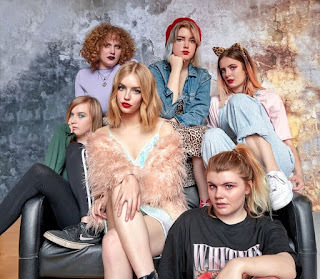 Naomi - Fred Perry Subculture described us as “the indie Spice Girls” in an article which I think is a pretty accurate description! 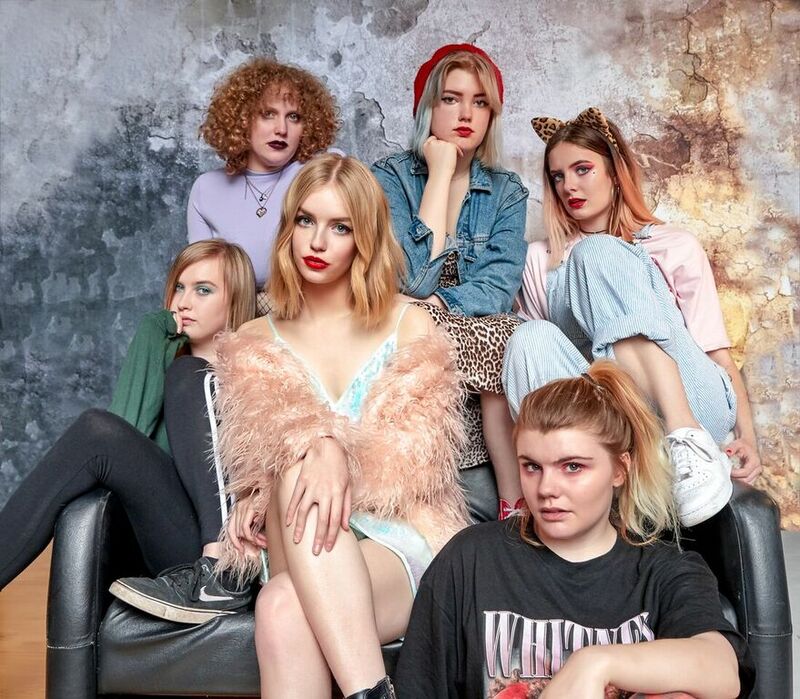 As an all-girl band we’re passionate about girl power and a lot of our songs have feminist messages, we all have our own individual style which is somewhat similar to The Spice Girls' personas, and our genre is generally indie pop! The Seamonsters are on Facebook and Twitter. They play Manchester Night And Day (January 25, This Feeling Big In 2019), Liverpool Jacaranda Phase One (February 3), Birmingham The Victoria (8), Middlesbrough Westgarth Social Club (March 2), Sheffield Crookes Social Club (9), Derby Riverside Live (23) and Blackburn Confessional Festival (September 6).